Kyoto is one of the most bustling and beautiful cities in Japan. 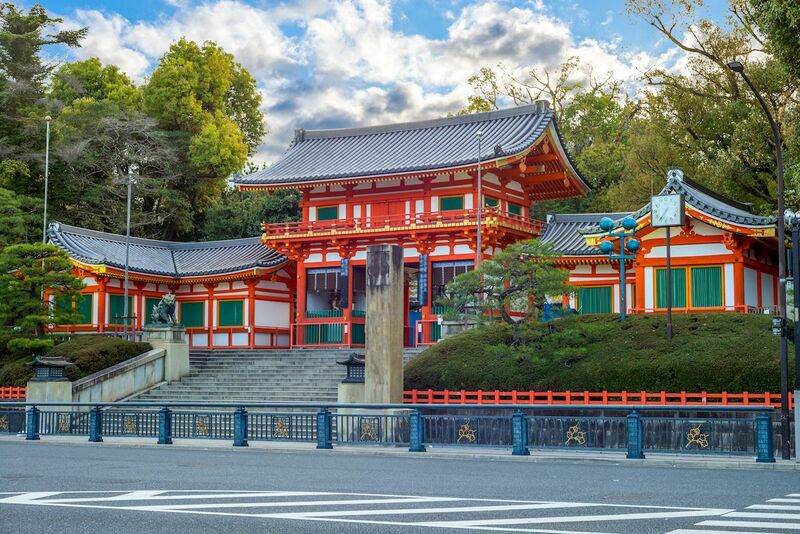 With more than 2,000 Buddhist temples and Shinto shrines, including 17 UNESCO World Heritage sites, it’s a perfect place to take in the country’s history and magnificence. All of those options are a blessing and a curse, however. Because Kyoto is filled with so many temples and shrines, navigating which to go to can be overwhelming — especially if you want time left to eat, shop, and explore other parts of the city. If you’re on a tight timeline or visiting Kyoto on a budget and want to see the best of the best, these are the five must-see shrines and temples to visit. Fushimi Inari is the most important Shinto shrine dedicated to Irani, the god of rice. It was established in the year 711, which predates the capital’s move to Kyoto in 794. 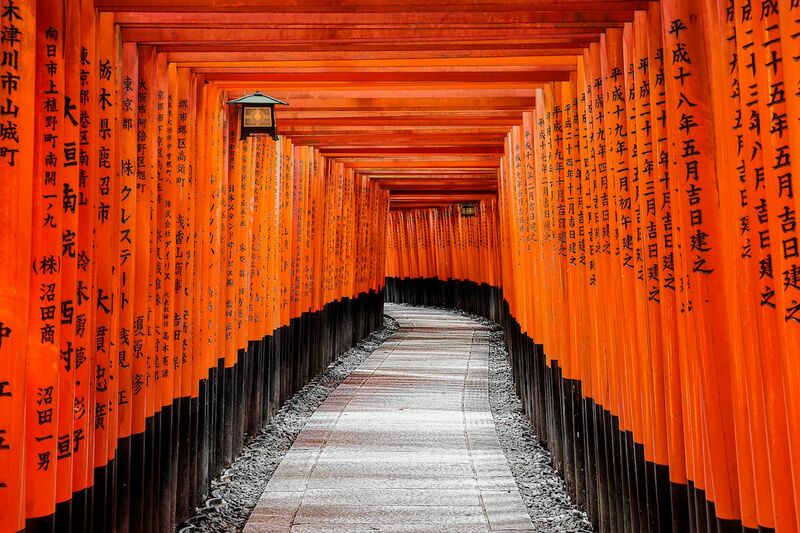 Fushimi Inari is famous for its thousands of vermilion torii gates, which span a network of 760-plus feet of trails. Your first stop when you arrive is the main hall, then you can ascend into the forest behind the ground’s principal buildings. While some may want to hike the entire summit — which takes two-to-three hours — we suggest trekking 45 minutes to the Yotsutsuji intersection where you can enjoy sweeping views of the city below. While Fushimi Inari is quite crowded during the day, it’s a peaceful and gorgeous place to visit after dusk, a time when you’ll practically have the place to yourself. Take note: Go in the evening at your own risk as nocturnal wild boars roam freely in the forest foraging for food in the later hours. Yasaka Shrine is adjacent to Maruyama Park, which makes it one of the most convenient shrines to visit during a trip to Kyoto. Previously known as Gion Shrine, it was founded more than 1,350 years ago, and it’s a must-visit if you’re walking through Kyoto’s Gion District, which is famous for the geishas who walk through on their way to work. The main hall combines the shrine’s inner sanctuary and offering hall into one building, which sits next to a dance stage that’s lit by hundreds of lanterns at night. Yasaka Shrine is best known for the Gion Matsuri festival in July, which is one of the most prominent in Japan and draws hundreds of participants. Maruyama Park is also one of the best places to view the cherry blossoms in Kyoto, which makes Yasaka Shrine an extra special place to be in the springtime. 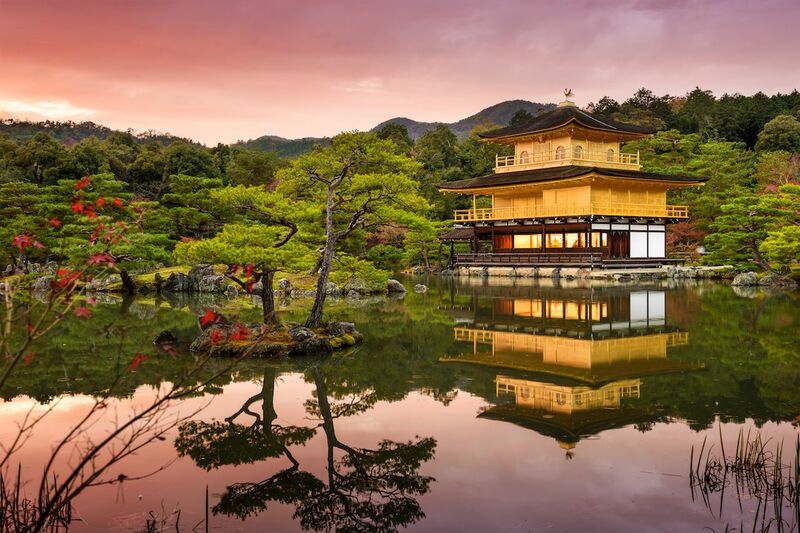 Also known as the Golden Pavilion, this breathtaking Zen temple is famous for its gilded exterior. Kinkaku-ji was formerly known as Rokuon-ji, and it was a retirement villa for the shogun Ashikaga Yoshimitsu. The temple was burned down numerous times, most recently in 1950 when it was set ablaze by a fanatic monk. The current structure was constructed in 1955 and features two top floors that are completely covered in gold leaf. 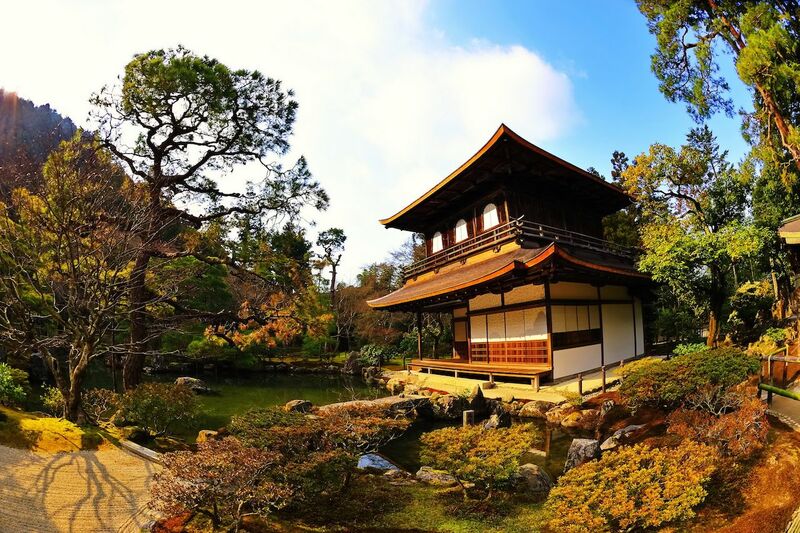 While visitors are not allowed to enter the temple, Kinkaku-ji is worth a visit just to get a glimpse of its beautiful exterior and lush grounds. If you go during cherry blossom season or in the fall when the trees are covered in red and orange, you can enjoy matcha and sweets in the tea garden right outside the main temple area and take in the beautiful scenery. Pro tip: Travel through Kyoto to Kinkaku-ji by bike for the full experience of the area. Located along Kyoto’s eastern mountains, this Zen temple is also known as the Silver Pavilion, but not because it features an embellished exterior like the Golden Pavilion. Shogun Ashikaga Yoshimasa built Ginkaku-ji in 1482 as his retirement villa and modeled it after his grandfather’s retirement villa, the Golden Pavilion. It’s believed that the nickname was given to Ginkaku-ji because its construction was in such contrast with its gilded inspiration. When visiting this Zen temple, you can enjoy a beautiful sand garden and moss garden, which features ponds, streams, islands, and bridges that offer a beautiful break in nature. The path through the moss garden climbs a hill behind the buildings where you’ll find sweeping views of the temple grounds and city below. While you’ll still come across tourists at Shorenin, you’ll likely find it less crowded than some of the other spots on this list. Shorenin is of the Tendai sect of Japanese Buddhism, and it’s one of Kyoto’s Monzeki temples, which traditionally had head priests who were members of the imperial family. It was founded in the 12th century by Emperor Toba as a residence for him and his son while they were studying under Enryakuji Temple’s head priest. Over time, it became a temple in its own right. A winding path leads visitors through the different temple buildings and gardens, which includes the art-filled Kachoden drawing room, Shijokodo Hall, a tea house, and a bamboo grove. 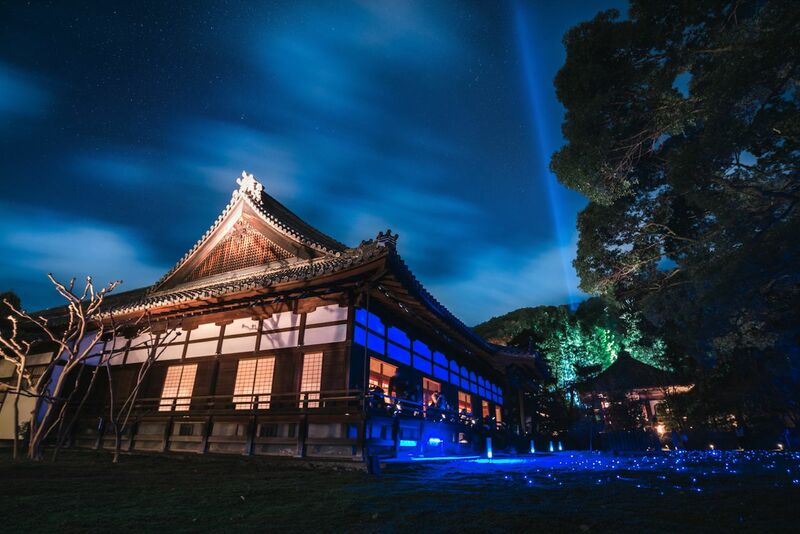 The real treat comes during spring and fall when Shorenin is open in the evening hours, and the gardens are illuminated.